New York City is called the 'City of Dreams' for a reason. Flying to the The Big Apple soon? Not sure where to go? It’s easy to get lost in the millions of blogs and reviews of NYC out there; it is, after all, The City That Never Sleeps. With the help of some of my New Yorker friends, we’ve come up with a list of must-see places for when you’re touring the city for the first time. One of the city’s newest landmarks allows you to gaze upon the stunning views of Brooklyn, Manhattan, and New Jersey. But the best part about the observatory? There’s no time limit. Feel free to take as many pictures and videos as you want. We recommend trying the restaurant inside—the view makes it all worth it. Drop by the underground tunnel after your observatory tour! The all-white marble interior makes this place one of the most Instagram-worthy spots in NYC. Fun fact: It’s the most expensive train station in the world. Aesthetics on point! Boat tours sound fun, but the truth is, they can be quite crowded and too expensive. Take the New York Waterway Ferry instead. For just $4, you’ll have a great view of the city. New York City is known for being a concrete jungle, but The High Line is where you can hang out if you’re in need of a little natural inspiration. Found right above the streets of Manhattan, this public park is a must-see for everyone. Need a break from all the sightseeing? 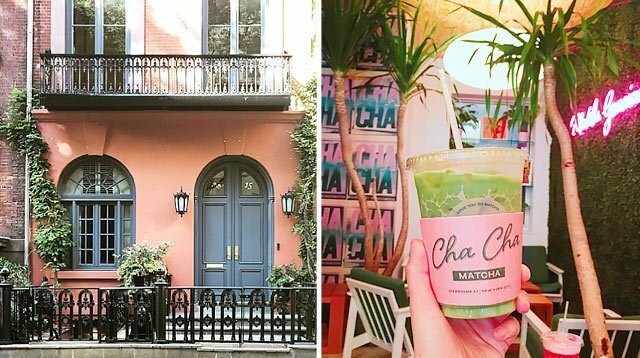 Satisfy your matcha cravings at this cute café. They have every matcha-infused dessert you could ever want. Here, you’ll find iconic sites like Washington Square Park and New York University (NYU). Take in the ~real~ beauty of Greenwich Village by strolling through the cobbled streets. Itching to shop? Check out the iconic Barney’s New York flagship store! And if you’re looking for the best location to take photos, head over to the white, spiral staircase located in the center of the flagship store’s atrium. You’ll have to make a reservation if you want to experience this spot. Not gonna lie, the view from the Top of the Rock is arguably better than that of the Empire State Building—which says a lot.